Their combination has worked wonders right from their first movie together – Roja. If one has the power of visualizing beautiful concepts, the other has the magic of adding life through brilliant music. Wondering what we are talking about? 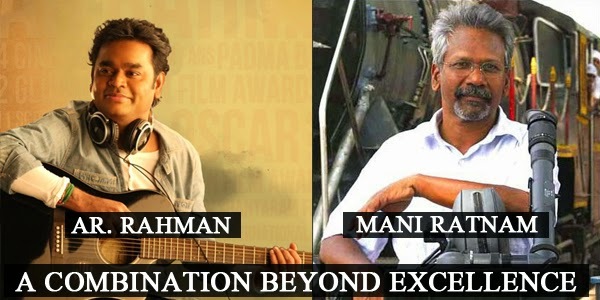 If you thought of A.R.Rahman and Mani Ratnam, you are absolutely right. The foundation of understanding was established right at the inception of their coming together thus helping in making sure every movie of theirs together in terms of the music was a hit for sure! Thiruda Thiruda which released in 1993, following Roja needs no introduction. The quality of the background score speaks for itself. Their hatrick hit was with Bombay that released in 1995. The reason for such brilliant outcomes can be that each of the genius inspires the other to go a step further and come up with astounding results. After the hatrick, there is more to it. The next hatrick we could say was the release of Iruvar, Dil Se and Alaipayuthey. Strong story lines with the apt use of music, there was another feather in the cap in the Indian film industry. The bond between this director and music director ofcourse has volumes to speak.There is not a single film with the duo coming together where we could say we were disappointed in terms of music. Every other movie was a hit. Moreover it is essential to also remember that ManiRatnam infact has released most of his movies in the Hindi language too apart from Tamil, and such is the dedication of Rahman for redoing the tracks in the different language too. Kannathil Muthammital, Azhutha Ezhuthu are other wonderful hits of the duo. Last year, the movie ‘Kadal’ was released. Although not well accepted in terms of the story, the song tracks made its way to success. What have the duo lined up for us next?